How can I train my 13 week old German Shepherd puppy to accept ferrets. He snaps at them whenever they get close. Would it be a good idea to have a muzzle on him until he gets used to them. We hold him when the ferrets are out and he is ok until they get too close. Please help with this issue. Total German Shepherd: No matter what you do it probably won't be easy and will require training - much the same way a sheep herder will train his dogs not to hurt the sheep but to follow them and keep them under control without attacking. In many dogs the urge to hunt small, quick moving animals is very strong and that stands to reason if we think about how dogs in the wild survive. They must be able to catch prey and the ability to notice any tiny movement and to stalk prey is an important part of the process. After all, a wild dog that is a bad hunter will go hungry and his life depends on his ability to hunt. But in our own domesticated dogs we often do not need them to use this prey drive (unless we want them to be working dogs of some kind perhaps). And in order for our dogs to get along with our other pets - birds, rodents, etc. - we have to train the dogs to ignore their prey drive. 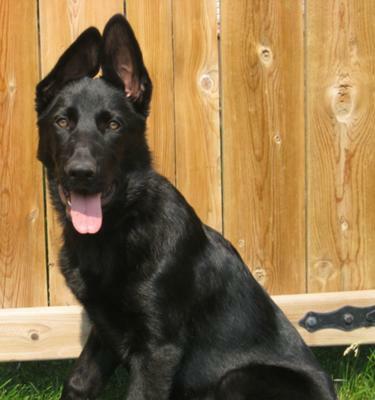 So, get your German Shepherd puppy into a training class and especially ask the trainer for help and suggestions on curtailing the dogs prey drive around your ferrets. At any rate, if an actual, physical class is out of the question, please watch some training videos on a similar topic to learn some methods as well as possibly getting some online dog training courses that you simply do at home on your own. And if you need a recommendation on a dog training course to do at home - just click on the banner above for a very good dog training course offered online right now. But at some point, if you want to clear up this issue and get your German Shepherd puppy to accept your ferrets without hurting them, then dog training is your only option. Keep in mind too though, that even in the event that you do training I would not advise you leave your German Shepherd and ferrets unsupervised - just as an extra layer of protection for them both. Good luck!